SIC Consulting was originally founded in the early 1990’s in Frankfurt Germany by a group of economic, mechanical and chemical engineers seeking to put in place a consulting company that specialized in providing strategic consulting services for Quality Management, Environmental Management and Business Management Systems adhering to ISO 9001, 14001, OHSAS 18001, ISO 20001, EN 16001, ISO 50001, ISO 27001, ECOSYS (integrated management systems). 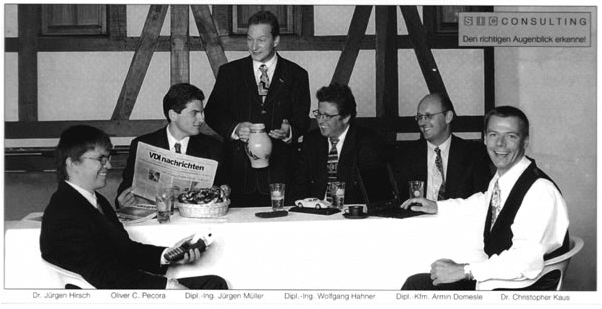 By the mid 1990’s the company was incorporated as SIC Consulting, GmbH – Germany (www.sicconsulting.de) and is still in operation today serving across many industries. Making a strategic business move, one partner, Oliver Pecora, moved from Germany to California in 1997, and formed SIC CONSULTING CO. Initially, similar services were to be extended in the USA as in Germany, however, Oliver refocused to serve in the technology sector within SIC CONSULTING CO.’s first year in operation after observing a greater need in that area. Establishing itself as a technology services company with a couple of technicians on staff in the following years, SIC CONSULTING CO. was incorporated in 2001. The goal when forming SIC CONSULTING, INC. was to expand and provide a larger spectrum of IT Consulting Services and more comprehensive technology solutions in the greater Bay Area – a specific area of expertise that followed Oliver’s career path and interests while helping companies better meet their desired quality standards by investing in the expansion of their computer systems – which at the time were often not even part of a network. In the following 10 years SIC CONSULTING, INC. focused on providing technology solutions to small and medium size businesses. Providing these solutions expanded the company to offer a wide spectrum of services ranging from common break/fix services, complete hardware and software solutions, their implementation as well as support and maintenance throughout the year. Throughout these years SIC continued to grow in experience, size and infrastructure. It was the experience in these years that would later inspire Oliver to refocus its efforts to a much more organized and less chaotic approach to resolving IT issues with a more strategic approach. Prior to this shift, a large percentage of clients were waiting for things to break before calling a technician, which often caused a lot of grief and ultimately didn’t provide the kind of end result we knew we could achieve if we could control more of the variables at hand. Seeking a better solution, Oliver discovered that this problem was not really much different in larger organizations where an entire team of technology professionals existed, even with IT Managers in place. Oliver discovered that what was lacking was a more structured and strategic approach in not only the IT Departments of larger organizations, but also with most outsourced IT service providers. This realization inspired a new and strong vision that would incorporate much of what SIC CONSULTING was originally founded for back in Germany – where they aimed to help companies create management systems that would allow them to operate more efficiently, grow and obtain the ISO certifications desired. Today SIC CONSULTING, INC. has transformed into an Outsourced IT Provider with focus on building relationships with those organizations seeking a partnership with organizations focused on delivering one end result – that of keeping technology running while keeping an eye on the big picture – the goals of the organization. Our team consists of Technical, Administrative, and Managerial Staff who all work together as a whole within a tightly integrated and organized Quality Management System. Our success stems from our structured approach to running a modern IT Department under the philosophy that “It is the team that delivers the desired end result and value, not the individual”.